Kent Volkswagen believes in 100% customer satisfaction. If in any way you feel that we have not lived up to your expectations please do not hesitate to contact us by phone, email or in person. We rely on the feedback to constantly improve our services and welcome suggestions. 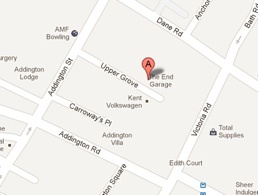 The garage is located in the road opposite AMF bowling alley close to Margate town centre. We are the last building on the right of Upper Grove. Where our customers come from. We have worked on customers vehicles from all over the UK but the majority of our work comes form the Kent area. Although we are based in the Thanet area (Margate, Broadstairs, Ramsgate), our customers come from all over Kent. We have regular customers who come from all over Kent for example Canterbury, Dover, Faversham, Folkestone, Whitstable, Maidstone, Medway and Ashford.